In the nineteenth century the Camden area was the piano manufacturing centre of London, with about 300 factories associated with the trade. Pianos are complex instruments requiring many different skills, so if on your explorations of Kentish Town, you see an old industrial building, there's a probability it was producing ivory keys, strings, or intricate woodwork. In contrast you will discover quite a few small cottages with delightful gardens hidden down alleyways. Start off by turning right out of the station along Kentish Town Road and go into Leighton Road. 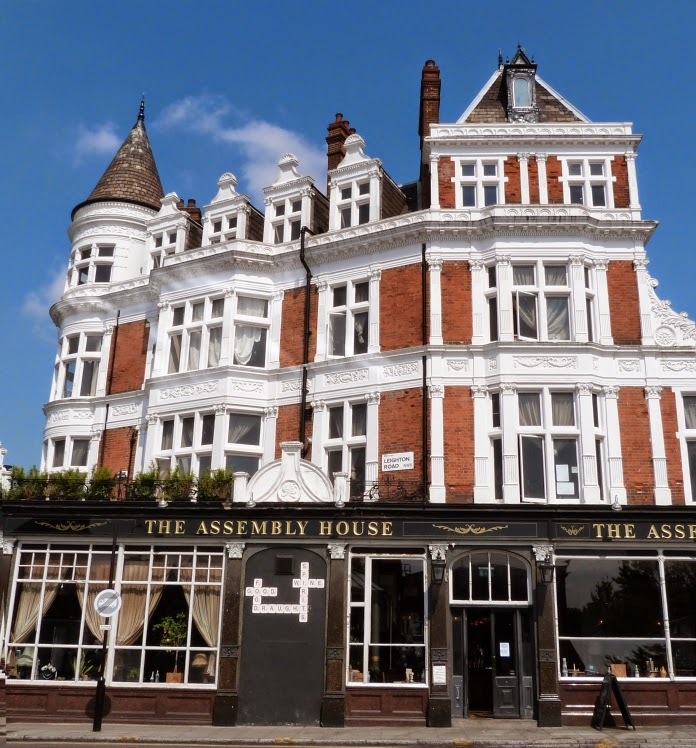 It has a massive pub on the corner, The Assembly House. The present building dates back only to late Victorian times (there is a statue of a boy holding a plaque with the date,1898, on the eastern wall), but in the eighteenth century one of the pub's predecessors was advertised as having a 'pleasant summer house' and 'extensive gardens'* Fortess Road to the north is a corruption of 'forty', this being the number of parcels of land - ‘The Forties’ - that made up the area. 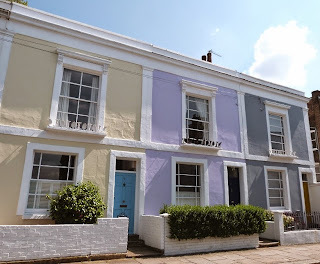 Leighton Road has attractive terraced houses and some 1850's cottages with arched windows. Don't miss the 1903 Postmen’s Office at No. 30: the lantern has been replaced, but the building remains a joy. 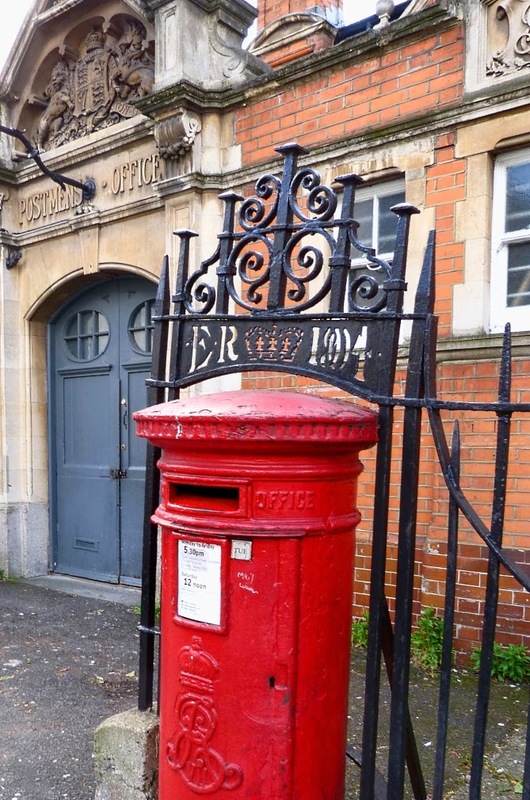 I like the way the post box has ironwork curving over it incorporating the initials 'ER' and the date 1904, the year after the office was finished. ('ER' stands for King Edward VII who reigned 1901-1910). 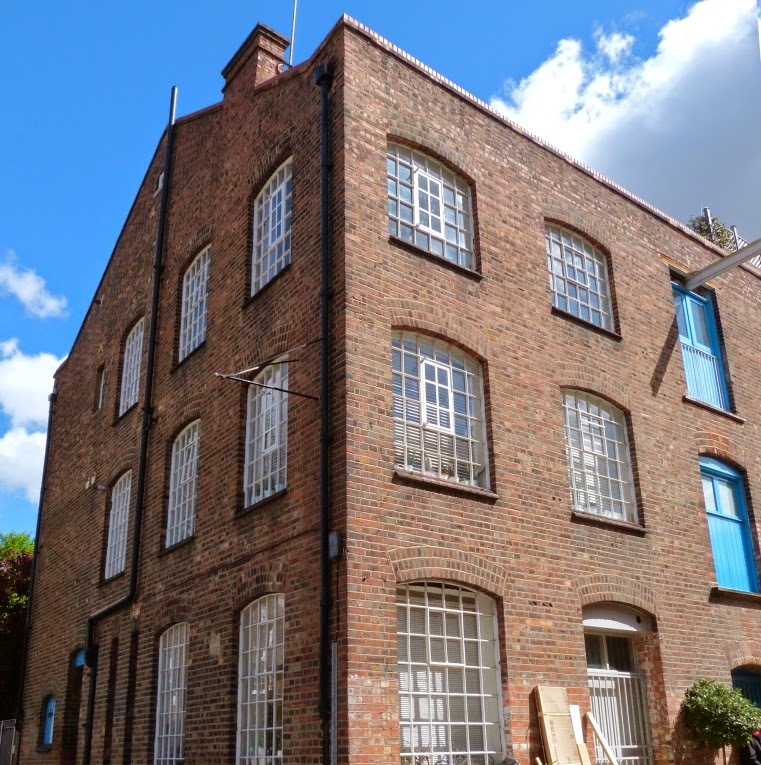 To find some examples of premises associated with the piano trade, continue up the road until Leighton Place where there is an enclave of former warehouses. The first one on the left (1900) was occupied by an organ key manufacturer and later by piano string makers. It has been transformed into studios. Opposite this at No.7 another firm was engaged in piano manufacture until 1912; subsequently it was used by a map-making firm in both world wars. Now a skills training centre. Several of the other addresses were connected with the piano trade, but the 1920's warehouses further to the right were home to a famous taxidermist firm. Potter back to Leighton Road and after a few minutes venture into an unmade-up way between two tall houses with steps. Note the painted sign on the wall 'Torriano Cottages'. This rather unpromising lane leads to a collection of fifteen mid-Victorian dwellings with tiny front gardens which would not be out of place in a country town. There is a smattering of good modern housing as well. Wander round to the left and you will emerge into Torriano Avenue, where cattle were driven from Kentish Town station to the Metropolitan Cattle Market in the Caledonian Road. Go left, then over the double zebra to pick up Leighton Road, walking right for a short time until the narrow Charlton Kings Road. At the bend was another musical instrument factory, this time creating Wurlitzer cinema organs. Now it's been converted to apartments. Return to Leighton Road, keeping to the north side. Look out for pretty cast iron window boxes - there are lots around. After Willingham Terrace (second after Torriano Avenue) there is a social housing estate which became the centre of a rent strike in 1960. 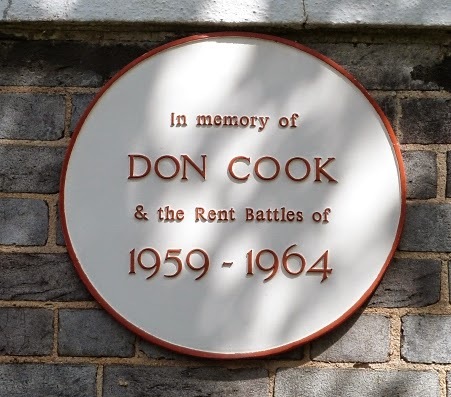 On Kennestoun House at the corner of Lady Margaret Road you will see a plaque to Don Cook who led a protest against rent rises. He and his wife were brutally evicted, their possessions being thrown out of the window. This led to violent protests by thousands outside St. Pancras Town Hall.The Cooks were eventually re-housed, but the rents never were reduced. You can read the full story here. Turn into Lady Margaret Road, take the first on the left, Falkland Road, then right into Leverton Street. 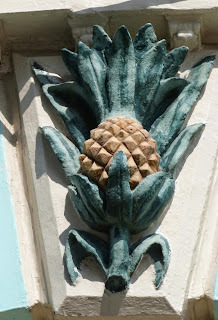 When you get to Railly Mews, there is a pub on the corner called the Pineapple (1852) with the appropriate fruit displayed in plasterwork on the outside. Enter the mews lane, which is still cobbled from the time when it was stables. In the 1890's a giraffe was kept in one of these until its home in Regent's Park Zoo was ready - one can imagine the tricks played on the pub's customers who had drunk one too many! Soon you will emerge into Ospringe Road. Almost immediately turn to the left, passing the bulk of St. Benet's church in Lupton Street. 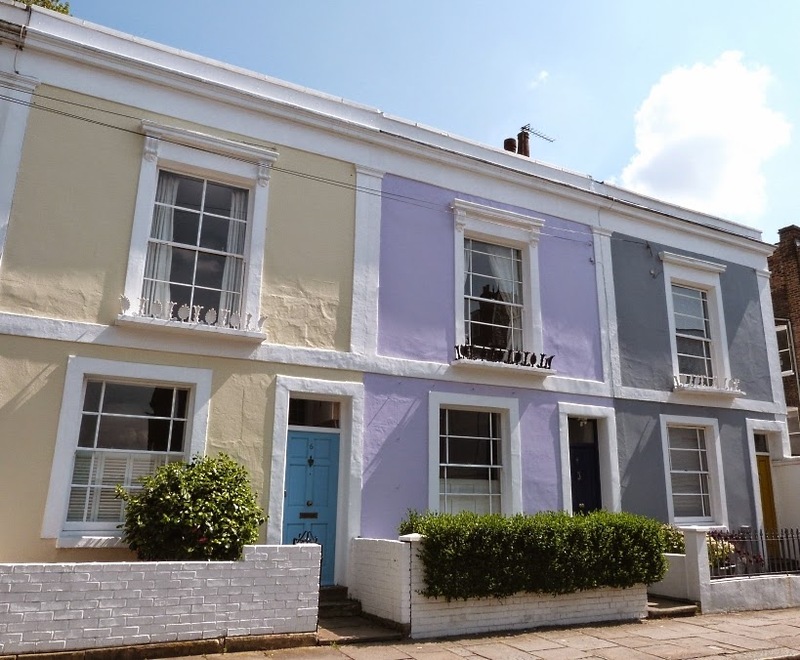 This was built in 1885 on an enormous Victorian dust heap, which, unsurprisingly, meant that underpinning was necessary only a couple of decades later. Not far away are two imaginatively laid out spaces for children to meet their parents safely near the Eleanor Palmer Primary School, which has jolly iron gates. Walk past the school and go left into Raveley Street. At Fortess Road turn left and look over to the corner of Lady Somerset Road where there is an ornate pub. 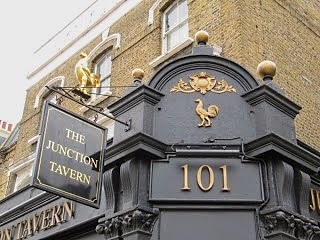 Junction Tavern is painted black and has three pedimented entrances with gilded balls on the top as if to remind customers that if they spent too much time and money drinking, their next stop would be the pawnbroker’s. 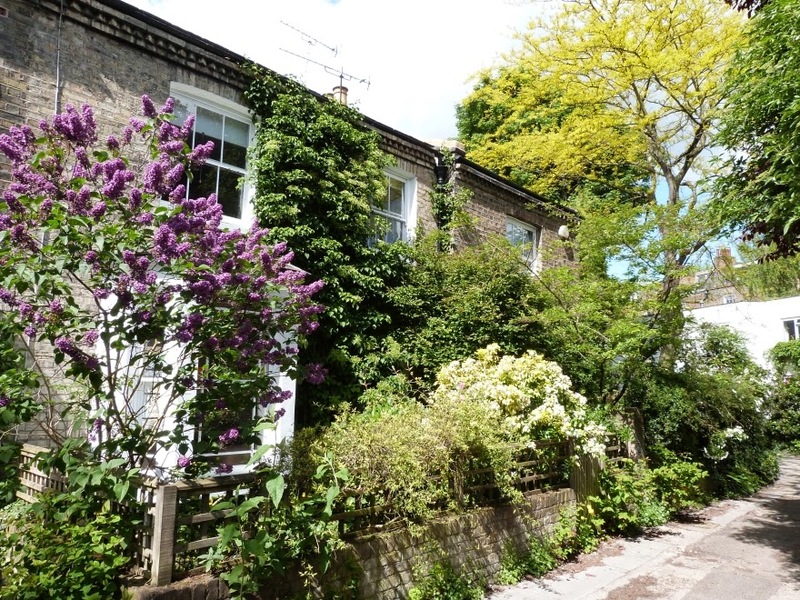 On your side of the road is a run of elegant terraced housing with long, shady front gardens (ca.1825). A handsome Victorian building, originally a Nonconformist chapel, can be found further down on the right hand side of the road. Less appealing is the block offlats that abuts the Georgian buildings just before the shops begin. The large building on the corner of Fortess Grove was once a piano factory, now converted to apartments.Turn into the alley. To the right is a little cul-de-sac with cottages, some of which were used as - you've guessed - piano workshops. 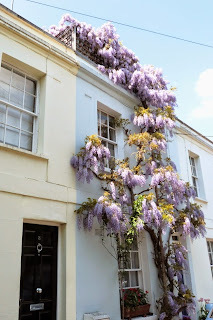 The wisteria which clambers over No.8 seems to be about to take over the building. Return to Fortess Road to find Falkland Road, first left, where it would seem people have a liking for cheerful colours. The ones in pastel shades remind me of an ice-cream parlour with rows of boxes, each containing a different flavour. 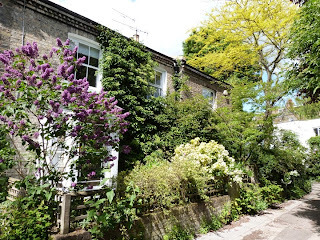 Quite soon wander into Falkland Place, an ancient by-way, and pass cottages and a playground created on a WW2 bomb site. There was a farmhouse on the east side, and the dark red brick wall near the end of the path was part of a substantial cottage. Turn left into Leverton Place, which will take you into into Leverton Street (more ice-cream). Go right to get to Leighton Road, then right again into Kentish Town Road. 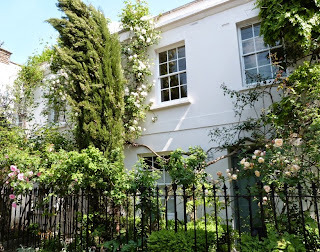 At the corner of Leverton Street is an eighteenth century survivor, a large house, its garden taken up by modern offices. Just before the Highgate Road/ Fortess Road junction cross at the lights to have a look at the Bull and Gate pub,which has some fanciful decoration. It used to be a well-known venue for indie rock, and many top bands had early gigs there. 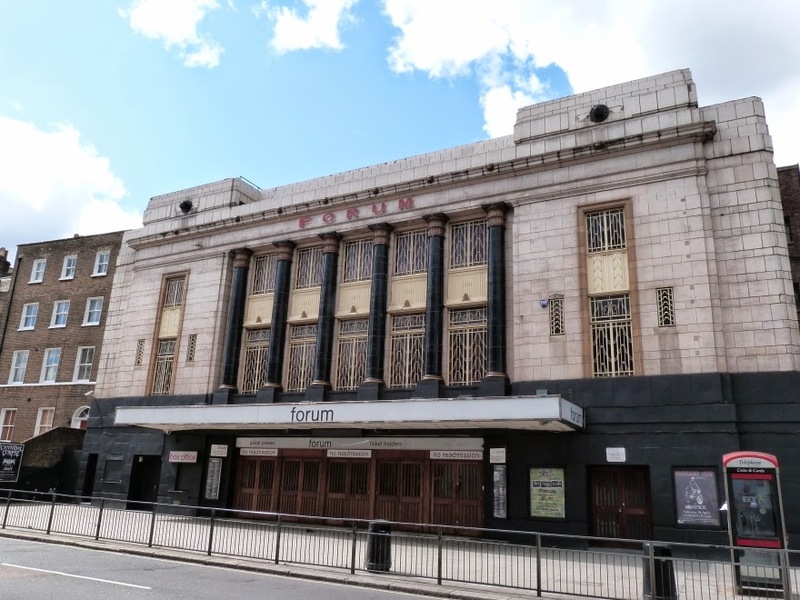 Further to the right along Highgate Road is the O2 Forum cinema (1934) - a interesting example of Art Deco. From here, retrace your steps, walking back down Kentish Town Road and you will soon be at the Tube station. 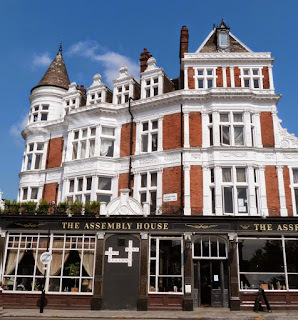 Assembly Rooms, Kentish Town Rd. 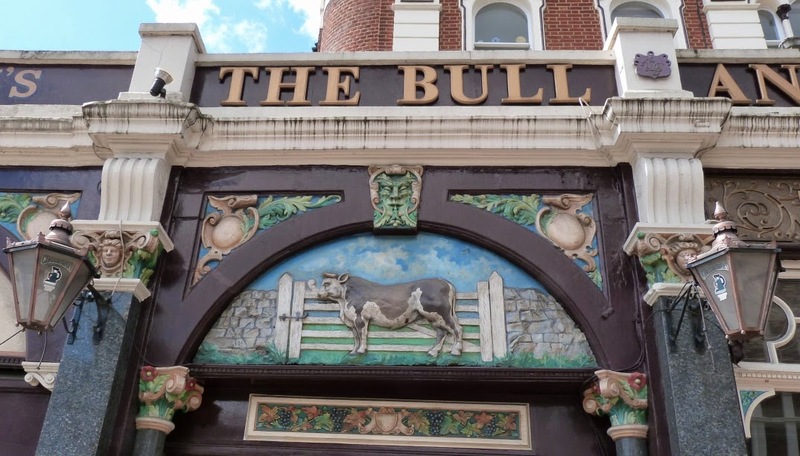 The Bull and Gate pub,Kentish Town Rd. *from 'Streets of Kentish Town' published by Camden History Society - a useful publication for those interested in exploring the area further. Kentish Town is just one route from the many to be found at London Tube Rambles. There are architectural gems, beautiful country views, historic places and quirky buildings even in the most unpromising areas covered by the outer London Underground stations. Usually the discoveries are within a mile of the Tube - often only five minutes walk away. If you reached this as an individual page via a search engine, you might like to click on the link above and see the other destinations explored. You'll be amazed at what's out there!